The University of Vermont (UVM) Eco-Reps are student leaders who encourage sustainability practices on (and off) campus, while fostering environmentally responsible behaviors among peers. According to their 2017-18 Annual Report, UVM kept 700 pieces of clothing out of the landfill by holding a clothing swap and collected over 6,000 pounds of food scraps and other compostable products from the residential halls alone. Way to go, UVM Eco-Reps! As I always say, you can’t fix what you don’t know is broken. That is exactly what the Eco-Reps wanted to know. So, they held a good old waste sort (or audit). Sometimes referred to as Trash On the Lawn Day (TOLD), a waste sort is when you hold aside all of the trash, recycling and compostable materials from an area, then sort it all into categories to see what’s being put in the correct bin – as well as what’s not. 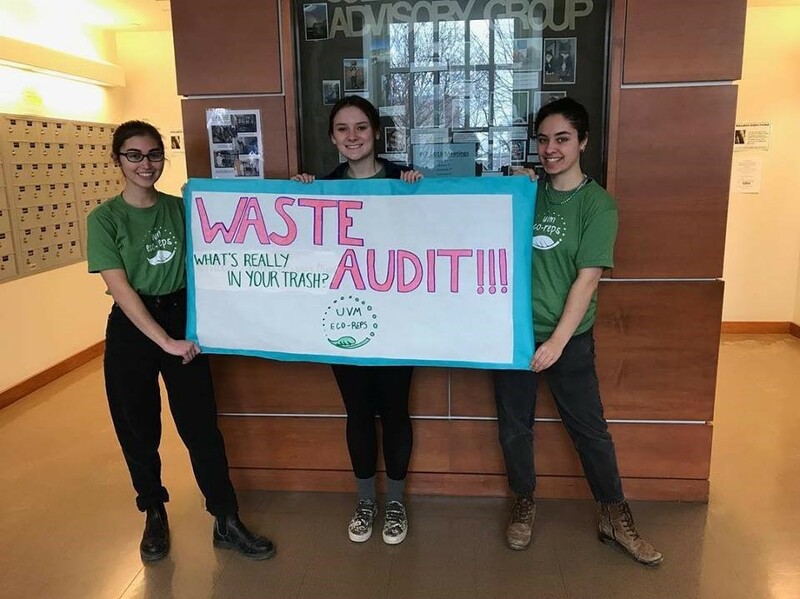 A waste sort gauges the effectiveness of the sustainability practices on campus and can identify some of the top issues that are affecting the quality of the recycling, such as food still in containers, or filmy plastic wrap and bags — what I call “flip-floppy” plastic — in the recycle bin. 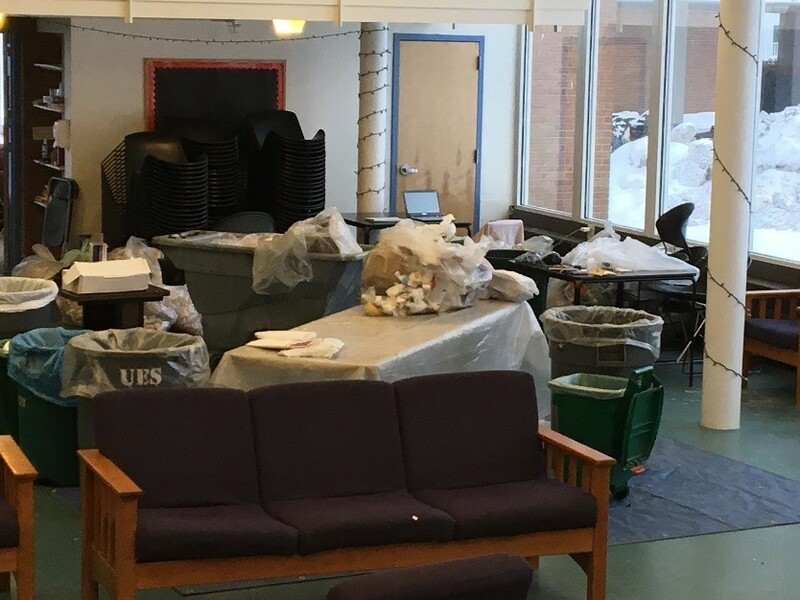 Once common contaminants — things that don’t belong in the recycling — have been identified, we can forge a plan of attack on the education front. Five teams of Eco-Reps and experienced helpers tackled more than 1,800 pounds of trash and recycling at five residential halls. I have to say I was delighted to discover that the recycling from all five halls didn’t have much trash or food mixed in. This is especially encouraging considering that many UVM students come from states where recycling rules and options may be very different from ours. But that doesn’t mean there isn’t room for improvement! In the end, Vermont’s ability to make sure our recyclables keep on getting recycled depends on all of us putting the right stuff in the recycling bin. Holding a compost event to raise awareness that leftover food and compostable plates and utensils go in the green compost bins – not the trash, and especially not in the recycling! Ensuring each resident knows where shipping boxes and pizza boxes go (recycling and compost, respectively). Promoting “Rinse and Recycle” to make sure people empty and rinse their containers and bottles before tossing them into the blue bins. In yet another heroic undertaking, the Eco-Reps also Greened the Gutt—Gutterson Fieldhouse, that is. That’s right, our brave Eco-Reps sorted through trash, recycling and compost collected from two Men’s Catamount Hockey games in February. To make their research even more interesting, the Eco-Reps assisted at the waste stations at one game, the other game they did not. Compost found in the landfill-bound trash decreased more than 50%! 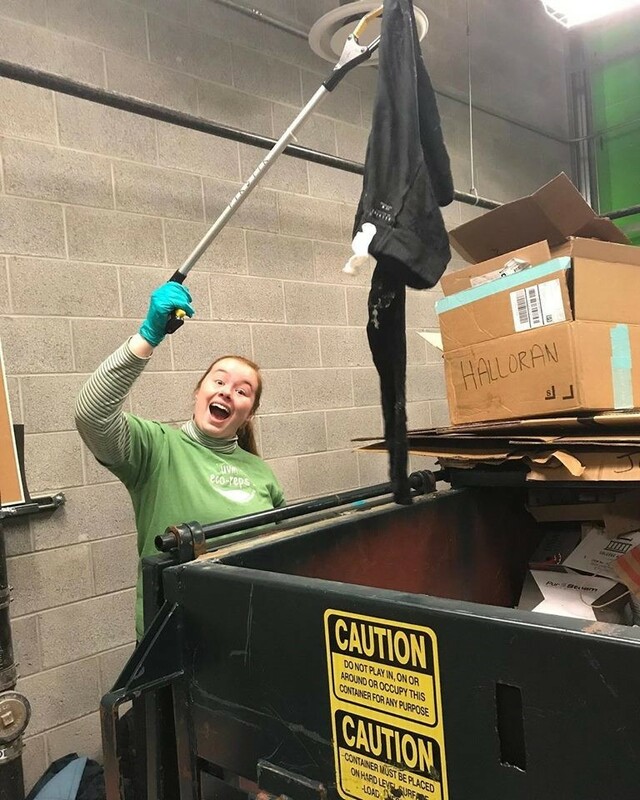 Trash found in the blue bins went down by 33%! Maybe a full-time job is in order for monitoring sort stations at the Gutt? Thank you to UVM’s Eco-Reps! A big THANK You to Team Trinity-Cate, Carlos, Kylie, and Hayley- y’all were a blast to work with for the day. I am excited to see what the UVM Eco-Reps have in store for the upcoming months. ,Be sure to check out the Points of Intervention Tour coming to UVM April 23-25. Keep up the most excellent work UVM; we are proud and grateful you are a CSWD partner in rockin’ the 3 R’s: Reducing, Reusing, and Recycling. When she's not setting up a worm composting farm or conducting a waste audit, Rhonda likes to hike and observe nature (she really digs bugs), ride her bike (preferably on the bike path) and cook with locally grown (mostly from her garden) foods. You can reach her at 802-872-8100 x211.